2013 Restaurant Christmas & Holiday Menus are here (link). Christmas Menu: Choice of one appetizer, two main courses (combo platter), side dish, and one dessert, along with complimentary glass of wine, rum punch, beer, fruit juice or soft drink. Link to menu. Price: $185, exclusive of 10% Service Charge & 15% VAT. Reservations (868) 624-4597. Special holiday menu (a la carte) for the month of December at Buzo. Link to menu on our Buzo post. Christmas Eve Lunch Buffet: December 24th; Price – $316.21 (Link to menu). All Hilton event prices above are exclusive of 15% VAT and 10% service charge. Most events include live entertainment, door prizes and giveaways. For reservations and more information, (868) 624-3211 ext. 6200 or email fb.trinidad@hilton.com. See flyer for details on discounts for Hilton Premium Club Members. Link to Hilton’s holiday calendar on Facebook. Price: $185 taxes included and half price for children under 10. Christmas Lunch Menu: 11am-3pm. Lunch includes your choice of an appetizer, a main course platter (The Traditional, Seafood Platter or The Premium, see menu for descriptions) and a dessert. Lunch is served with a choice of a Soft Drink, Juice, Ginger Beer, Tea or Coffee. Link to menu on Facebook. Prices: The Traditional or Seafood Platter – $249 and The Premium – $304. Prices are inclusive of 10% Service Charge & 15% VAT. Reservations (868) 624-1181 ext 5555. Menu: Appetizers – Roasted Pumpkin & Green Apple Soup, Beef Pastelles w/Spicy Chow Chow, Mixed Salad w/Mandarin Oranges, Raisins, Pecans & Feta Cheese. Main Course – Butter Roasted Turkey Breast, Ham & Pineapple Skewers w/Pineapple Rum & Brown Sugar Glaze, Cranberry Basmati Rice, Cassava Oil Down, Stewed Pigeon Peas, Cheesy Crushed Plantain and Vegetables. Dessert – Creamy Cheesecake topped with Rum Soaked Fruit. Price: $190 per person plus taxes includes complimentary Christmas Cocktail. Reservations are needed; Arrangements can be made for dinner for groups. (868) 622-6287. Special Holiday Menu Items: Honey glazed ham, roasted turkey, sweet potato casserole are available for a limited time during dinner hours of operation for the month of December only. Link to flyer on Facebook. Price – Special items are INCLUDED in the regular dinner menu and price. Christmas Lunch Buffet (Every Monday, Wednesday & Friday in December through to Dec. 24th.) Check the Capital Plaza Facebook page to see the menu for the day. Buffet includes soup, salads, entree and desserts. Price – $189, exclusive of 10% Service Charge & 15% VAT. Reservations (868) 625-3361/8 ext. 7681 or email sales@cplazatrinidad.com. Lunch Menu – Hot & Cold Selections, Salad, Sides & Desserts; also includes: (1) Glass of Wine, Fruit Punch, Sorrel, Ginger Beer OR Ponche Creme. Taste of Christmas Lunch and Dinner: December 1 – December 25. “Choose one menu item from our selection of appetizers, entrees and desserts.” Link to menu on Facebook (download or right click & open in new tab to enlarge). Prices: Lunch: $275/person; Dinner: $350/person (prices exclusive of tax & service charge). Reservations and more information, call (868) 623-2222. Christmas Buffet and Prix Fixe Menus: Buffet Menu – Soup, Salads, Meats, Sides & Desserts. Prix Fixe Menu – Appetizer, Main Course, Dessert. 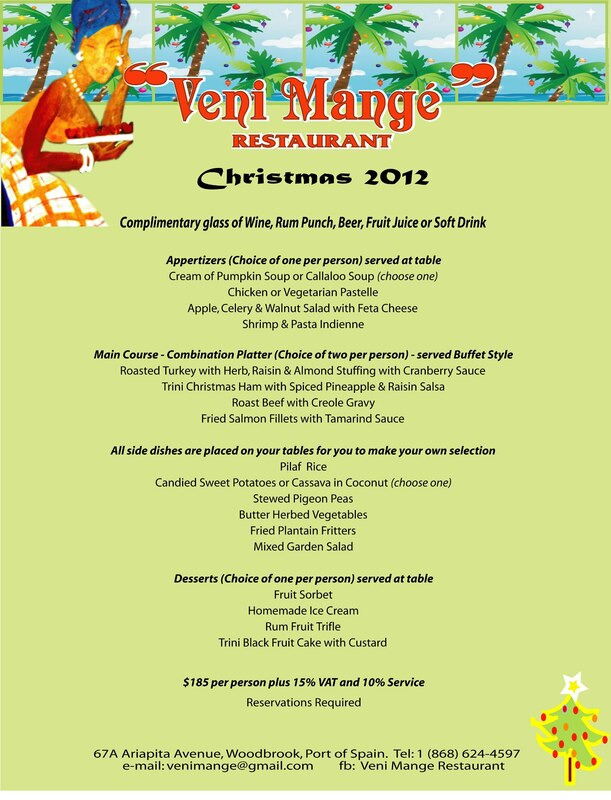 Link to Christmas Menu at Joseph’s Restaurant Trinidad. Buffet Price – $250 plus taxes and Prix Fixe Price – $220 plus taxes. Both menus come with a complimentary glass of sorrel cocktail or ponche de creme. Buffet menu is for groups of 20 people or more. Reservations (868) 622-5557. Christmas Platter Lunch Special for December – Honey Glazed Ham, Roasted Turkey, a Mini Pastelle (beef or vegetarian), plus any one side order from the menu. Lunch is 11:30-4pm and all platters are $100 plus 10% Service Charge and 15% VAT. (868) 627-CAFÉ (2233) or (868) 627-5612. Woodford Cafe (POS) Annual Christmas SOIREE featuring Bunji Garlin & Scrunter – Tuesday, December 18, 2012, 9pm-3am; Free Cutters, Complimentary 2 4 1 Drinks & Free Shots 9pm-11pm. Link to POS Woodford Cafe’s Christmas Soiree flyer on Facebook. vcdguestlist@gmail.com. Woodford Cafe (Chaguanas) Christmas PARTY featuring Kes The Band – Wednesday, December 19, 2012, 9pm-3am; Complimentary Cutters 9pm-11pm, Free Shots & Drink Specials. Link to Chaguanas Woodford Cafe’s Christmas Party event listing and flyer on Facebook. vcdguestlist@gmail.com. Santa Claus is coming to Magdalena Grand’s Salaka Grill on Dec 25th, 11am – 2pm. Christmas Day Brunch at Pembois Restaurant & Terrace: Dec 25th, 12pm-3pm. “Celebrate this joyful day with your loved ones while feasting on our brunch” and enjoying a Parang Band. NOTE: Every effort is made to keep this list updated, but please call to confirm special holiday menus, days and times, as well as prices. All menus and prices as well as the days and times are subject to being withdrawn or changed at the restaurant’s discretion. Check out our recipe roundup of traditional Christmas dishes (link) in Trinidad & Tobago for menu ideas for your own Christmas dinner or lunch. Tags: Christmas Menus Trinidad Restaurant. Bookmark the permalink.